Okay, it’s also about the format. In my last post, I wrote about how the choice between Netflix streaming and DVD was about the content. 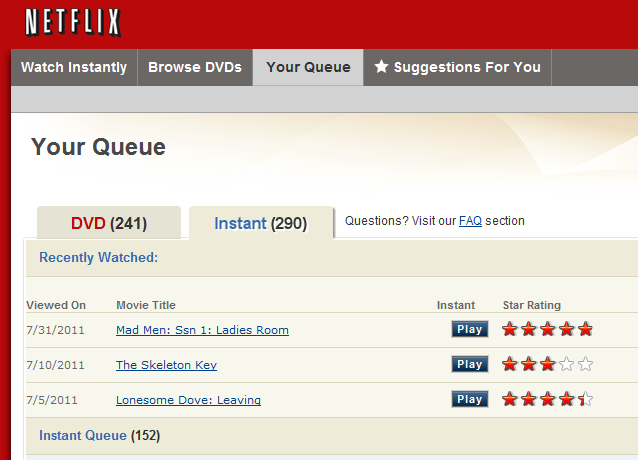 Netflix’s streaming content is mostly poor quality and quantity, while you can get almost anything you want by DVD. But format also makes a difference. If the content was the same in both formats, I think streaming would have a definite advantage. The ability to instantly watch a movie from any internet-connected device is a great advantage of streaming, although many people don’t have a wired internet connection near their TVs and setting up a wireless network is beyond them. Streaming provides the freedom to choose what you want to watch, when you want to watch. Although sometimes that freedom of choice can be paralyzing. When you have DVDs, you feel a commitment to watch them. They came in the mail, and even if you turn them off and send them back, it will be a while before you receive more. With streaming if you don’t like what you’re watching, you can stop and have a multitude of choices available. Sometimes I find the initial choice of what to watch difficult enough, but if a movie doesn’t grab me quickly, I end up second guessing myself and wondering whether I should have picked something else. Having so many choices instantly available seems to cheapen their value, whereas a DVD that I need to watch and return to get another, seems more urgent to watch. DVDs require much more maintenance of your queue, strategically placing new releases at the top to get them sooner. What you watch tonight is based on a decision you made several days or weeks ago. We’ve all experienced that feeling of disappointment receiving a DVD other than the one we expected. The queue for streaming isn’t that important, except to prioritize which items you want to watch first and to save items that you might want to watch later. The mailing schedule of DVDs can require strategic maneuvering. To make sure you have your new DVDs by the weekend, you have to make sure that the previous DVDs are returned by Wednesday. How many families have been annoyed by a slowpoke who didn’t watch a movie and return it in time to get another for the weekend? To be the first in line to get a new release that comes out on Tuesday, you can time the return of your DVDs on Friday or Saturday. Send them back too soon or too late and you may not get the new release. With the decline of DVD sales, studios are beginning to become unfriendly to the rental market by creating rental-only copies stripped of special features and filling them with previews and ads that you can’t skip through. I recently watched a new release from Warner Brothers that had 17 minutes of non-skippable previews and ads, including several promoting the purchase of the Blue-ray version. Streaming, for now, contains no previews or ads, but the studios’ influence can be felt in the limited quantity of streaming titles and Netflix’s price increase to cover the increased cost of licensing content for streaming. So it’s the format and the content. Streaming is a more efficient format, but the content needs to vastly improve before it will replace DVDs. The recent customer uproar over Netflix raising their prices was a little overblown. It’s a business, they need to make money. With the expense of negotiating contracts with studios over streaming content, Netflix needed to adjust their pricing. I understand that, and that’s their right. Although as customers, we have to decide what to do. Keep what we have and accept the price increase or make changes. I started with the 3 DVD at a time, unlimited plan about 5 years ago. When Netflix added their Watch Now streaming, I saw it as a nice bonus. Most of the time I had enough on my hands trying to keep up with the 3 DVDs. I only watched the streaming when I didn’t have a DVD to watch. But for me it’s all about the content. I couldn’t care less about the mode of delivery. Netflix’s DVD library is huge. I can get almost anything I want, and 3 DVDs at a time is more than I can handle most times. In contrast, their streaming Watch Now content is full of movies and TV shows I’ve either already seen or never wanted to see. Also there’s a lot of just plain crappy movies. Sure there are a few things I’ll miss. 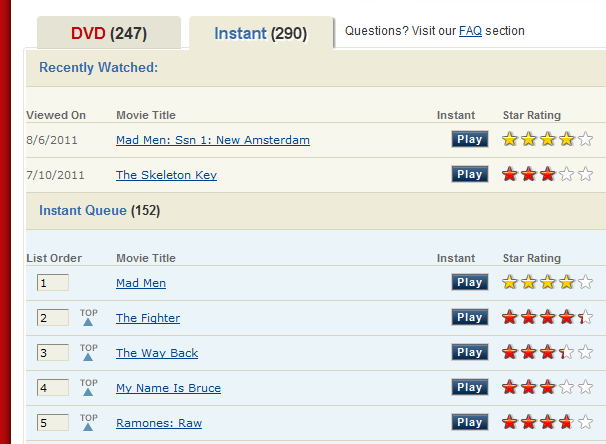 I just started to get into Mad Men now that it’s on streaming, but then again I can also get those on DVD. So I’ve decided to cancel the streaming from my 3 DVD at a time plan, and just go with the unlimited 3 DVDs. It’s actually going to save me about $5 a month. Ironically, I think that’s the opposite of Netflix’s hope to wean customers off DVDs and onto streaming only. If they really want to get streaming going, I think their subscription model is a good plan over pay per view streaming services. But it will never be worth it to me until they get a better streaming selection and new releases. Again, it’s about the content.